Here’s a look at what’s coming out from Marvel for November 2015. A full list of solicitations is available here. The “Secret Wars” fallout is over, and Marvel’s still relaunching a bunch of new #1’s set in their “all-new, all-different” post-“Secret Wars” merged/mixed-up reality. Thus the long list of rebooted titles above. Miles Morales is on the all-new, all-different, all-rebooted-yet-again Avengers team. Meanwhile, the “original” 60s X-Men are still around in the present, I gather, with apparently zero effects on Marvel’s timeline despite everything that’s happened. In less confusing corners of the Marvel Universe, we’re getting a new comic featuring Marvel’s favorite red dinosaur, Devil Dinosaur. 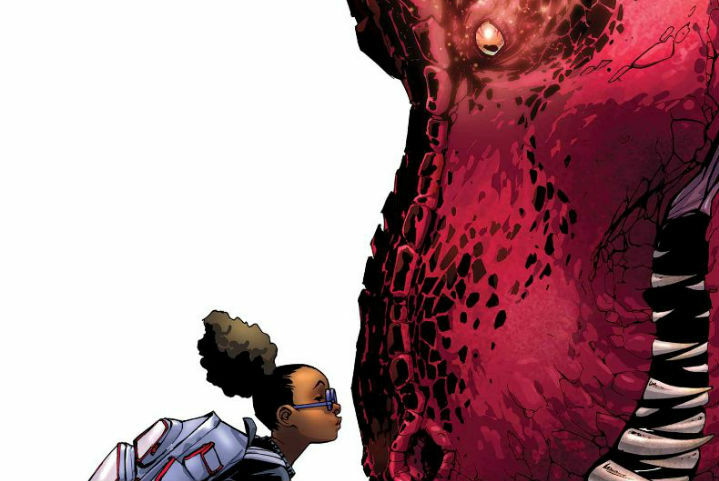 Teaming up with the T. rex is a new character, an African-American girl going by “Moon Girl.” She apparently has Inhuman genes, in keeping with Marvel’s increased push of the Inhumans as (film-rights-secured) mutant-substitutes. “Squirrel Girl”‘s cover and solicit are pretty funny. “Captain America” sees the return (somehow) of “Capwolf,” a story about Steve Rogers becoming a werewolf. Ant-Man’s title sees the return of Darla Deering, aka “Ms. Thing.” Darla possesses the “Thing Ring” (of “Fred and Barney Meet the Thing” fame) that lets her gain the Thing‘s powers.